I have a love-hate relationship with pears. When they are ripe, they are the most beautiful, juicy, and flavorful treats. Any other time, they fall completely flat. For this recipes, I decided to put our differences aside, and give some TLC to some pears. When it comes to the dessert menu, I hardly ever understood why anyone would ever chose a poached pear or cheese plate over decadent cheesecake or gooey chocolate cake. While I still don’t know why cheese finds its place among these sweet treats, I think I finally understand the beauty of a poached pear. Taking the time to basically make a sweet, cinnamon-y jacuzzi for your pears definitely pays off. Poaching pears definitely alleviates some of that heartache when they are not perfectly ripe. The pears become sweet, tender, and can be infused with whatever flavor you’d like. Plus, it will leave your kitchen smelling absolutely amazing! Although you might be tempted to eat the poached pears right out of the pot, pairing them with cranberries in this layer cake makes for the perfect fall treat. 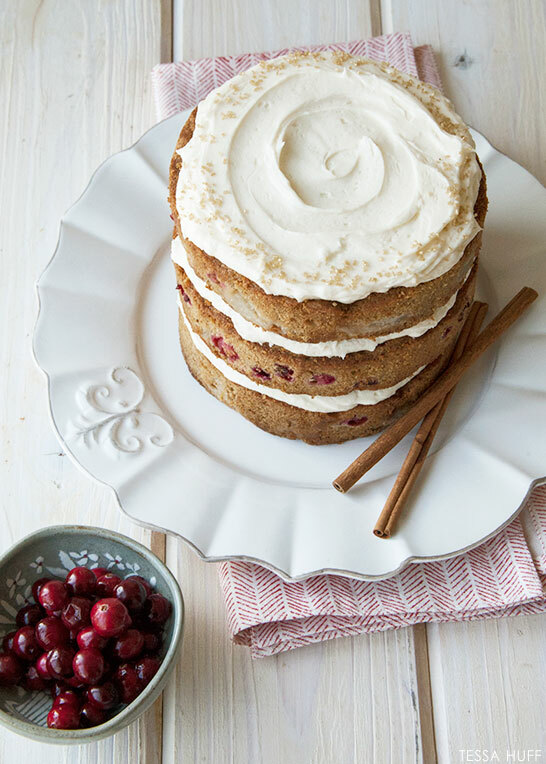 The sweet tang of fresh cranberries is brilliant in a stacked layer cake. The added cinnamon and cardamon create warmth in every bite. If you don’t know about mascarpone, you will be in for a big surprise. Think of this frosting as cream cheese icing’s more elegant, older sister. 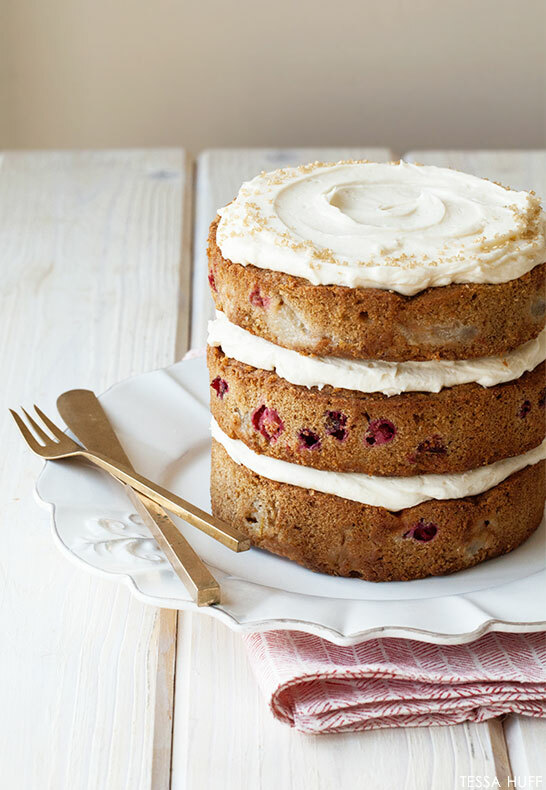 And trust me, this Pear-Cranberry Cake calls for nothing less. Place 1 cup sugar and 4 cups water with the cinnamon sticks in a medium saucepan and bring to a boil. Once the liquid reaches a boil, add the pears and turn heat to medium-low. Simmer pears about 10-15 minutes, or until soft. Remove from poaching liquid, core, and chop. Reserve 1/4 cup of the poaching liquid. Sift together the flour, cinnamon, cardamon, clove, salt and baking soda. Set aside. In the bowl of an electric mixer, cream together the butter, oil, granulated sugar and brown sugar. Mix about 5 minutes on medium-high. With the mixer on low, add in the eggs one at a time. Scrape down the bowl. With the mixer on low, carefully alternate in the dry ingredients and the 1/4 cup reserved poaching liquid in two batches. 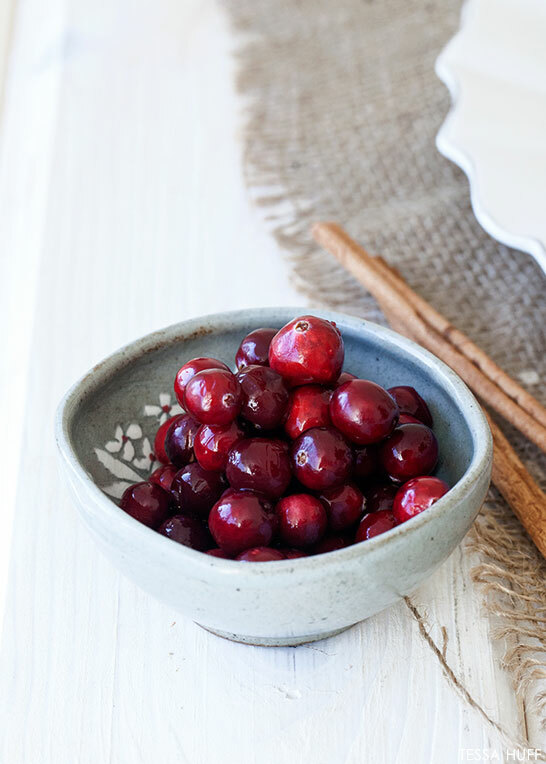 Fold in the chopped pears and cranberries. Bake at 350 until centers are done (about 24 minutes for 4 X 6inch pans). Cream the butter and mascarpone with an electric mixer. Carefully add in the remaining ingredients and mix until light and creamy. Stack cake layers alternating with the mascarpone frosting. Sprinkle top edge with gold sanding sugar, if desired. Beautiful cake! Poached pears has always been one of my favorite fall desserts and I can imagine they go magically in this cake with cranberries and mascarpone frosting. What a delightful cake! I’m going to make this for my birthday brunch. My guests may not leave after they get a taste of this! Looks amazing! I can’t wait to try this out for Thanksgiving. Thanks for the recipe! Hi, thanks so much! I tried your receipt and it was so yumyum. Only thing is my firsttime frosting, got too liquid.. any ideas? I am a cooker, not a baker and i am attempting this recipe tonight… I hope mine turns out as pretty as yours and tastes good too! I will post the results on my blog for viewers. I want to let moms know we can just follow a recipe we don;t have to be chef! made this as cupcakes and topped each with a few sugared cranberries. they were amazing! thank you! 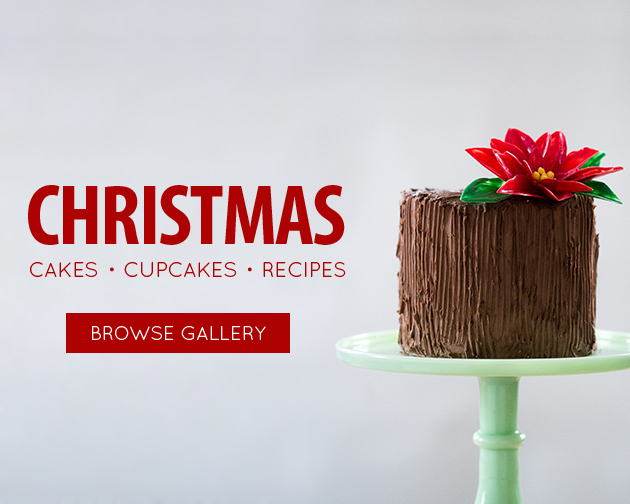 I’m going to make this for our annual Christmas dinner this weekend – I can’t wait to try it! 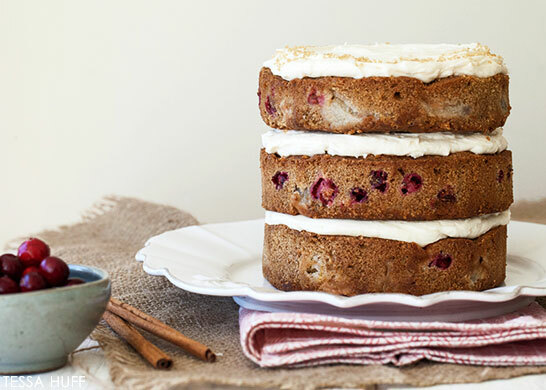 Hello, your cakes are gorgeous… what size pans do you use with the pear/cranberry cake? and is there a way to increase the hazelnut cake for a 9 inch pan to serve more people? Thanks for your assistance! I made this for the first time last year and fell in love! I was craving it so bad this summer and couldn’t wait for pears and cranberries to return to my local market. I made this as cupcakes for the office today and everyone keeps asking for the recipe so I am sending them your way. So a delicious recipe, and I like that it’s not overly sweet! Hello, can you please explain “Bake at 350 until centers are done (about 24 minutes for 4 X 6inch pans).” Does this mean four 6″ pans? How many cups of batter does this cake recipe make? Thank you. 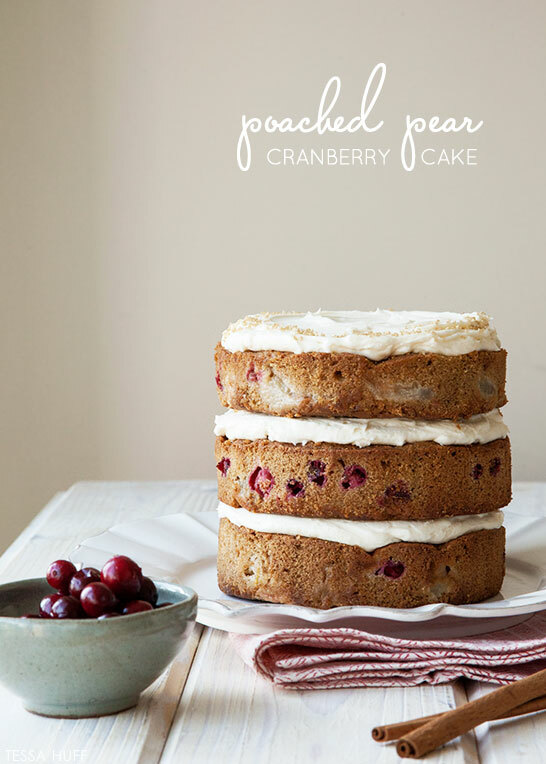 Thanks for finally writing about >Poached Pear & Cranberry Cake <Liked it!